Robert Donaldson was the son of Robert and Sarah Ann Donaldson of Dromore Middle, Clogher, County Tyrone. He was born about 1894 The 1911 census records Robert as a 17 year old student, still with the family in Clogher. 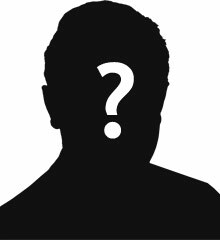 His father is a contractor, builder and farmer. 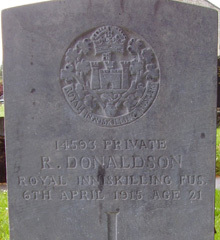 Private Robert Donaldson was serving with the 9th Battalion of the Royal Inniskilling Fusiliers when he died on 6th April 1915, age 21. Fivemiletown Church of Ireland Cemetery lies on the Murley Road. If coming from Dungannon, the Murley Road is a right turn at the entrance to the village. The Churchyard is 50m along that road on the right hand side.